"CAUCASUS MTNS., A REGION OF LEGEND AND MYSTERY TO THE GREEKS. HERE PROMETHEUS WAS BOUND." - Gilbert Grosvenor, ed. Sakartvelo (Georgia) is an ancient land teeming with complex, often sparring cultures. Svaneti, the most beautiful and picturesque alpine region, is situated on the southern slope of the Main Caucasus Range, its virgin waters cascading steeply downward from stunning mountains such as the twin peaked Ushba, through glaciated highland valleys to form the rivers Enguri, Kodori and Tskhenistsqali. This timeless, unique land has preserved until the present day the unrepeatable splendour of nature's first creations, magnified in stark relief through its rugged landscapes, painting a rare, exotic picture of the harmonic convergence of cultural and geo-historical legacies, resplendent in its many-faceted flora and fauna. Ancient turrets rise to vie with lofty crags. Svaneti artistic creations of gold and bronze, copper and earthen wares, knitting and handicrafts give testament to its native ingenuity, encoding its myths of creation in folklore handed down from time immemorial, echoed in the plaintive strains of Svan music. In ancient times the Greco-Roman civilized world evinced great interest in Svaneti (witness the myths of Jason and the Golden Fleece [Colchis was the home of Medea and a special center of sorcery. Strabo explains the legend of the Golden Fleece for which Jason sought by saying that the natives strained the gold from their mountain streams through fleecy skins.] and Prometheus and the Caucasus [Aeschyllus and Apollodoros described the location, appearance and dimensions of the double-vaulted mountain where Prometheus was bound, evoking highly symbolic images reminiscent of Svanetian mythology associated with Mount Ushba.]). In the 19th century Svaneti became the object of inexhaustible interest for writers, artists, and travellers from around the world. Hence Svaneti has acquired various non-de-plumes such as "The Land of a Thousand Towers and Glaciers", "The Treasury of National Culture", "A Living Scientific Laboratory" and other noble designations. 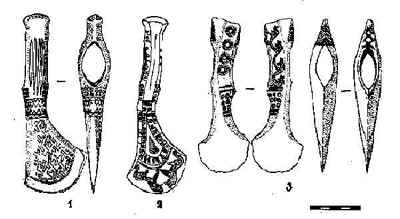 Bronze axes from Upper Svaneti, 8th century B.C. Bronze figurines of the 5th-4th centuries B.C. At the present time, archaeological research in Svaneti (and for that matter, in the whole of Georgia) has been suspended in connection with the continuing economic financial crisis. The expedition simply does not possess adequate governmental, corporate or institutional funding to cover expenditures and necessities in order to carry out basic field research on a material-technical basis. It sorely needs a contemporary computer configuration (integrating server-monitors-high res. scanner-printers-copiers-faxes-modems-digital still & video cameras) with compatible architectural CAD software for the purpose of amplifying archaeological reconstructions, generating graphics, enhancing photographic procedures and reconfiguring designated exhibits (artifacts), whatever the size or the scope of the finds. The Svaneti Expedition (if reconstituted) additionally needs mountain-climbing equipment and clothes, sleeping bags and tents; electrical generators and an array of western-standard lighting equipment (cables, fixtures, replacement bulbs) for the proper illumination of the old mine workings (galleries); materials for the rigging and re-shoring of the mine workings infrastructures; horses and equestrian supplies, an all-terrain jeep for reconaissance; a truck with independent suspension to ensure the safe transfer of archaeological remains; and for the pick-up and delivery of fuel a small tanking trailer is also required. The purchase of relevant equipment, such as basic spellunking gear, handheld satellite telemetry devices for zeroing in on (and re-locating old) finds and the cartographic tools necessary to chart them, would be a step in the right direction. Finally, the Archaeological Institute seeks to acquire instrumentation to facilitate radio-carbon dating procedures and X-ray analysis of material finds. The Archaeological Expedition of Svaneti has presently at its command for the reception of foreign colleagues and invited guests, the following: an archaeological base, basic transportation, lodging (under communal living conditions), flats in Tbilisi and Svaneti, and interpreters. My dear friends: Georgia has recently taken its first steps towards eventual integration into the European Economic and Political Union. It has already established promising scientific, cultural and economic contacts with the United States of America. The Expedition Center of Svaneti for Archaeological Research is looking for serious sponsors to help underwrite the expense of mounting future expeditions. We hope to collaborate together with leading archaeologists and anthropologists in the sphere of researching the physical and spiritual culture of Svaneti. We also seek legal representation for contractual purposes and a university publisher for a proposed English language translation of my book Ancient Svanetia, which is available for your review (in Georgian) upon request. Please respond on a timely basis, indicating if your institution has an interest in participating in digs this summer, and/or assisting our Archaeological Center in Tbilisi and Museum in Mestia, which would like to create a travelling exhibition of Svanetian artifacts in the United States during the forthcoming year. Come to Sakartvelo and enjoy the wonders of exotic Svaneti.